Haiti is often in our thoughts and prayers. We think of you and our experiences with you. We extend our love and gratitude to each of you who served with us. You’re examples to us in your faithfulness and steadiness. It was a treasured experience for us. Here is a little update. We had a volunteer service assignment in Jerusalem (2005 - 2007). 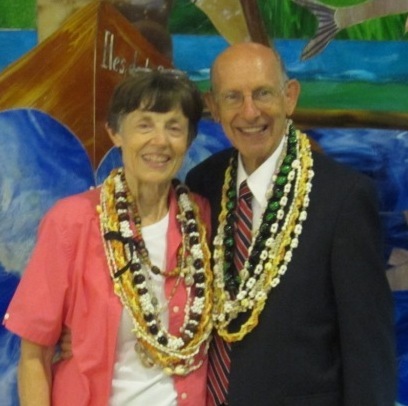 Then we served for three years in the Papeete Tahiti Temple (2009-2012). Beginning May 2013 we will serve for a year in the Democratic Republic of the Congo Kinshasa Mission (Gabon Mission Region). Haïti est souvent dans nos pensées et nos prières. Nous pensons à vous et à nos expériences avec vous. Nous exprimons notre amour et notre gratitude à chacun d'entre vous qui ont servi avec nous. Vous êtes des exemples pour nous dans votre fidélité et de constance. Ce fut une expérience précieuse pour nous. Voici une petite mise à jour. Nous avons eu une mission de service bénévole à Jérusalem (2005 - 2007). Ensuite, nous avons travaillé pendant trois ans dans le Temple Papeete Tahiti (2009-2012). À partir de mai 2013, nous servira pendant un an en République démocratique du Congo Kinshasa Mission (Mission Région Gabon). Michael Finlinson Moody, 58, Woods Cross 3rd Ward, Woods Cross Utah Stake. Ward Young Men president former stake president, bishop and counsellor, high councillor, ward choir director and music chairman, and missionary in French East Mission. Chairman of Church's General Music Committee and manager in Church Music Division. Received doctorate in church music at University of Southern California. Born in Payson, Utah, to Milo Cresfield and Virginia Finlinson Moody. Married Maria Ann Toronto, seven children. She is an institute of religion instructor, former ward and stake family history consultant, ward organist, Relief Society and Sunday School teacher, counsellor in stake Relief Society presidency, ward music chairman, and music director, and Relief Society pianist born in Richfield, Utah, to Joseph Young and Ila Christensen Toronto. Content copyright © 2018 M.K. Paquette; All rights reserved. Logos copyright © 2018 LDS Mission Networksm · mission.net / ldsmissions.net · All rights reserved.